Google's new iPhone Gmail app brings long-awaited support for multiple Gmail accounts. Google released a major overhaul on Tuesday of its email app for the iPhone and iPad. App updates aren't usually that exciting, but this one matters for three reasons: We use email a lot. There still isn't a perfect iOS email app. This is Gmail. Gmail's new release is a total revamp. Up until now, you've only been able to log into a single account using the app -- a huge disadvantage for Gmail junkies who create new accounts for sport. Now you can add up to five separate mailboxes. The stock iOS app has always supported multiple Gmail accounts, but the only path to push email delivery in Apple's built-in "mail.app" is to configure the Exchange-based Google Sync -- something that would drive a tech Luddite to tears. Gmail's new app now bridges the gap. Along with expanded account support, the revamped Gmail app features infinite scrolling in message lists, the ability to directly respond to Google Calendar invites from the app, and a completely redesigned user interface, which looks positively beautiful. Word of warning for existing users: The new app needs to be re-downloaded entirely and not just updated. All in all, the app feels faster and smoother, and the lighter color palate of the top layer makes it easier for your eyes to make their way through the never-ending sea of mail. The iOS Gmail app has always been better than Apple's own app at handling folders, labels, priority inboxes and, most importantly, search. These cosmetic upgrades enhance that experience. Whether or not Google (GOOG) used elements of the Sparrow email app it acquired earlier this year is uncertain, but a report from Apple (AAPL) watcher MG Siegler says the Sparrow team was not involved. Either way, this is a far cry from when Gmail first launched its app last year on the iPhone. That version lacked push delivery, multiple user accounts and offline viewing. In short, it was an unusable mess. The new app still doesn't officially support offline viewing -- it kind of, sort of lets you return to previously viewed mail, but without any reliable indication about what is and is not cached. 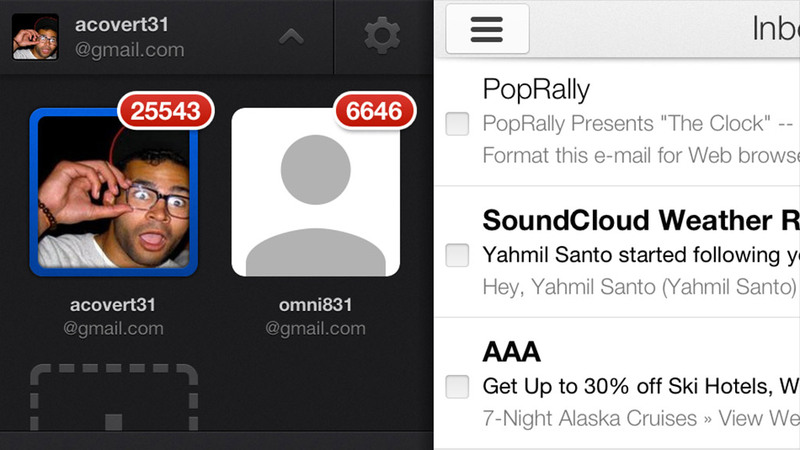 Still, all the gradual improvements add up to the best iPhone email app for power Gmail users.